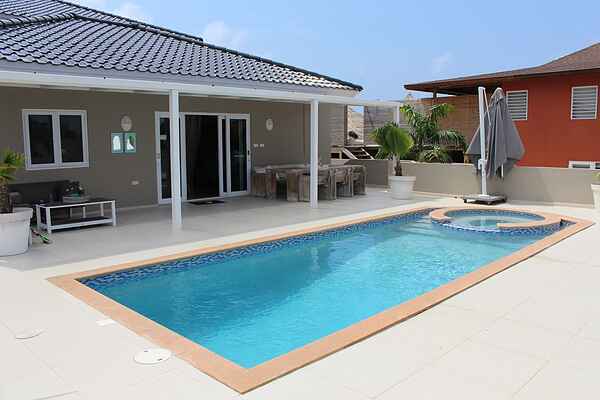 Enjoy the ultimate troische dream vacation in this luxury villa in the upscale neighborhood Visto Royal in Jan Thiel Baai.Op this part of the island, also called the St Tropez of Curacao, is always something going on. This villa is completely furnished new in the summer of 2016 and offers a lot of luxury and comfort with a magnificent private pool and Jacuzzi. The villa has partial sea views and offers a breathtaking view! With all the romantic lights this view too "s fantastic evening. The villa can accommodate 8 adults and 2 children and is extremely comfortable with a hip and desgin device. Downstairs is a gourmet kitchen and spacious living room and two bedrooms with bathroom, one with jacuzzi. on the first floor there are two spacious bedrooms with private bathroom and an additional living room with spacious seating area. the sofa that is in this room is suitable as an extra bed for 2 children. this area has a plafondfan.Ook the outdoors at this villa is extremely comfortable and there is also missing it not for luxury! on the veranda you can dine and drink on the large dining table or on the lounge chairs. There is a bar, outside fridge and BBQ aanwezig.Geniet a delicious beach day on Zanzibar and Papagayo beach and close off the day with a cocktail or a glass of wine during happy hour at one of the trendy beach clubs!